When the foothills are muddy, recreationists are asked to use different routes. The work of fixing trails after misuse is a never-ending battle for trail managers. Heads-up intrepid Boise foothills hikers, bikers and runners: time to find an alternate route for your cardio adventures. 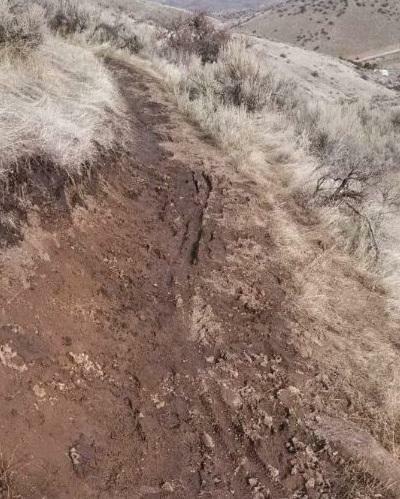 The recent rain in the Treasure Valley has wreaked havoc on the trails, making them soft and muddy. Trail managers are encouraging people to check conditions before they head to the hills this winter. Here's the link to updated trail conditions and alternatives (Boise River Greenbelt, 8th Street Road and Rocky Canyon) from the city's Ridge to Rivers system. “Our trails get tremendous use throughout the year, but the most damage from that use comes each winter from visitors who use the trails when they are soft and muddy,” says Ridge to Rivers Program Manager David Gordon in a press release. Erosion is a yearly problem when the ground is wet, and foot and bikes tracks leave grooves – making hiking use more difficult even after the trails dry. Rule of thumb suggested by trail managers on Facebook: if you're leaving tracks or scraping mud off your tires or shoes after a run, it's best to find a new route.